Hobie Kayaks introduces the revolutionary new Hobie EVOLVE Series powered by a Torqeedo Ultralight 402 electric kayak motor. For the first time in kayak history, you are one touch away from quiet, clean, and efficient electric propulsion. Go for hours at a steady two knots or pour on the juice for a burst of speed. It's your call. This compact, German-engineered motor is custom designed with two different types of Hobie mounts to slip into your existing Hobie kayak. Quietly slip through the bass-choked shallows...Give your muscles a break during a lengthy bay cruise...Introduce a non-paddling friend to kayaking with power...The choice is yours. And with Hobie's new Hobie EVOLVE hard shell kayak series and one for the inflatable kayak series. Great motor, put it on the rudder of outback mirage. I use the mirage drive but with somewhat bad legs I thought this would be useful if needed. Haven't "had" to use it but it is does work exceptionally well. I really like this product. A bit pricey but very well integrated into the Pro-angler. What really makes it worth having for me at my age is the peace of mind it provides when fishing on lakes when the wind comes up. The Lithium battery provides plenty of power and range to get me to the fishing holes across the lake and back safely. When installing make sure you don't place the battery over your fish finder transducer to avoid interference. The kit is easy to install and works great. The problem is the shaft seal fails and ruins the motor and gears if fishing line gets into the prop. The manufacturer does not cover this and they know it is a problem as they say they are developing a line cutter to help with this. The manufacturer told me they will not cover any damage due to fishing line but they are making a device to stop it. I have been in boats fishing for over 40 years with motors and never had seal damage due to fishing line. They have a problem and will not back up their product. I had to buy a replacement motor do to this. If you use one of these be sure and shut down as soon as you know your line has tangled in the prop and pull the prop and clear the line to prevent failure. It took me over 3 weeks to get an answer from the manufacturer on this problem and what they would do; they did nothing except admit the problem, and sell me a replacement motor for $600. Bought the Toqeedo Evolve 2 years ago,,, First year enjoyed,, second year the connectors corroded even though I used a recommended spray on the connectors so I replaced the cables,,, Then Torqeedo recalls the battery and keeps me waiting 3 months for a replacement, because get this new battery has different cables so a adapter is now needed which was out of stock. So I spent 3 times what a trolling motor should cost and it sits unused while I wintered in the Florida Everglades. I had big plans to use it in Florida bay! Overall it's a good product. Easy to install but does require tools to cut holes etc. You can download the installation guide from Hobie's website to understand what's needed. On my Revo 11 I reached a top speed of 6mph on flat waters; light chop I reach 5.5mph; moderate chop 4mph. I travel mostly at mid speed which makes flats and coves I would not have pedal out to convienently accessible. Unlike Hobie's advertisement, the evolve is no where near silent or quiet. It's noisy. It's louder than some of my fishing pals trolling motors. My unit isn't defective, it has been confirmed by other evolve and Torqeedo Ultralight owners. Not a big deal in my opinion. I have it mounted on the rudder. The kit comes with parts so you can switch it between the mirage drive, rudder mount, or not use it. Ive been using this with my pro-angler for the last couple of weeks. Motor is super light and takes up less space than than the mirage drive and stores easily in the forward hatch when / if I decide to pedal. Battery life is excellent and I usually get about 12+ miles of range @ 3.8 MPH. Only reason for 4 stars is price, but Ive got no regrets. 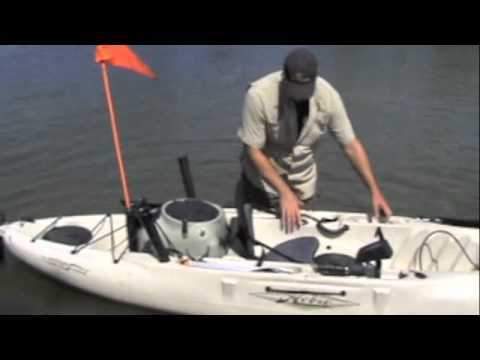 A: The difference between the Hobie Evolve Torqeedo Motor Kit v2 (5471) and Hobie Evolve Torqeedo Motor Kit i-Series v2 (2517) is that the i-Series is for inflatable kayaks. Q: Is this compatible with the Torqeedo 915Wh battery? A: That battery will power this motor kit. Q: Is the remote throttle included? Q: Is the Evolve motor permanently attached to the rudder? How does one pack the inflatable in it's bag with the motor attached? How difficult is it to remove for storage if it can not be packed in the bag? A: No you will be able to remove it and put the rudder kit in. Q: I have a 2015 Hobie Mirage Outback and I would want to install this motor using the rudder option. Will I still be able to raise and lower the rudder unit with the cord handles from the front of the kayak? I am worried about the added weight and strain that will put on the cords. A: Hi, Thanks for the question. Regarding the Hobie Evolve Torqeedo Motor Kit v2 you will beable to still use the rudder unit with the cord handles. The added weight of the motor will not affect the lever or the cords on the kayak. You should still be able to lift and lower the rudder system even with the Torqeedo motor mounted to the mid section of the kayak. Q: What would the approximate maximum range be for a TI? Q: "Will this mount to the larger sailing rudder or only the standard rudder? A: This motor can be mounted on any Hobie Mirage Drive kayak no matter the rudder size. Q: Can the motor go in reverse? A: Yes, the motor does have reverse. A: The draft on the evolve from the hull to skeg should be no different than that of the draft that the mirage drive produces. The same draft depth is achieved.